i loved it. stanley buys zombiekins at a yard sale. zombiekins starts a zombie plague. Thanks, AXEL! This book sounds really funny. 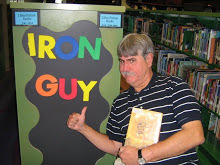 Another good friend (and Honorary Guy),Ms. Yingling, reviewed it on her blog. There are plenty of copies in the system, so go get one and tell what you think! 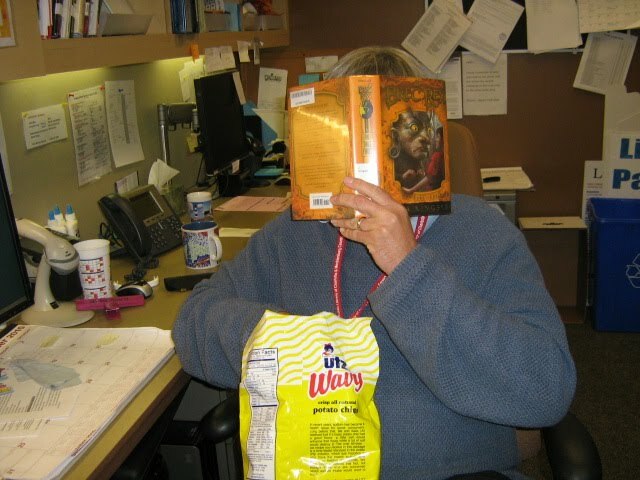 "We Now Resume Our Regularly Scheduled Erec Rex Reading"
Won't be hard to do--the story's really getting good. Erec has been captured by King Augeas, the Nightmare King, and trapped in his realm. Shudder!! It's--it's--wow, it's really scary there and I hope he can get out! Stay tuned, readers! AXEL (and Others) Get Their Lost Hero Prizes! Hey, ho, guys! 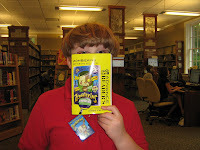 We had a great time yesterday with our Find the Lost Hero game. 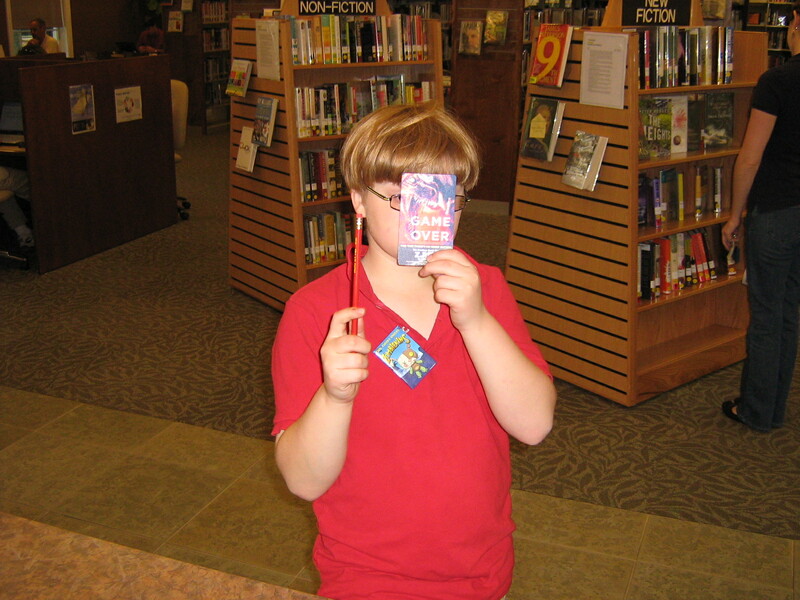 Nine kids showed up and braved the dangers of the library, including the Nefarious Nonfiction, the Biography Bastions, and the Card Catalogs of Doom to complete their quests. Actually, what really happened was that each kid got a game sheet and followed the clues on the sheet to complete the game. Fortunately, I got a picture of one of the brave and noble searchers and it was none other than our good friend AXEL SIMONE!! Here he is with some of his prizes: They're hard to see but they are a library pencil, a card that advertises the Z. Rex book, and a pin for a book called Zombiekins. It turns out that we had a copy of the book in the ultracool prize box, so I gave him a copy, expecting that he send in a review. Congratulations, AXEL, and everyone else! 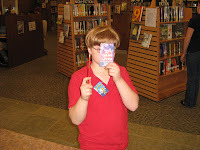 We hope to have more fun events at the Myers Park Library in the future! AXEL started the Zombiekins book and says it's funny. Let us know how liked it, bro!! October is here and that's good news for a lot of reasons. You've got the cool weather here at last (which is good news for us here in hot and humid Charlotte), the trees will put on their gold, orange and red bling before long, and there's Halloween, Thanksgiving, and Christmas to look forward to. 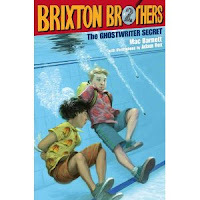 It also means the arrival of some great new books like Behemoth, The Ghostwriter Secret: Brixton Brothers 2, The Lightning Thief: The Graphic Novel, and The 39 Clues: Black Book of Buried Secrets. 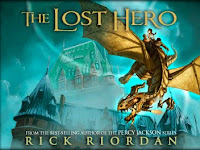 But the most-anticipated book this month is The Lost Hero by Rick Riordan. 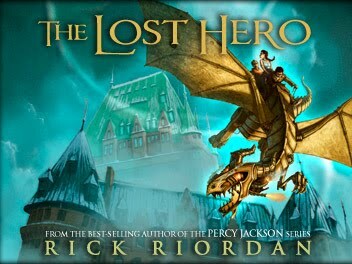 It's the first in the Heroes of Olympus series, which will be all about the kids at Camp Half-Blood. (You can read the first two chapters here) The book comes out Tuesday, October 5, so I'm going to hold a Find the Lost Hero game that day from 3:00--6:00 here at the Myers Park library. It'll be a scavenger-hunt game. Come to the desk, get your game sheet and use it to search for the Lost Hero. There will be prizes for everyone who completes the game. 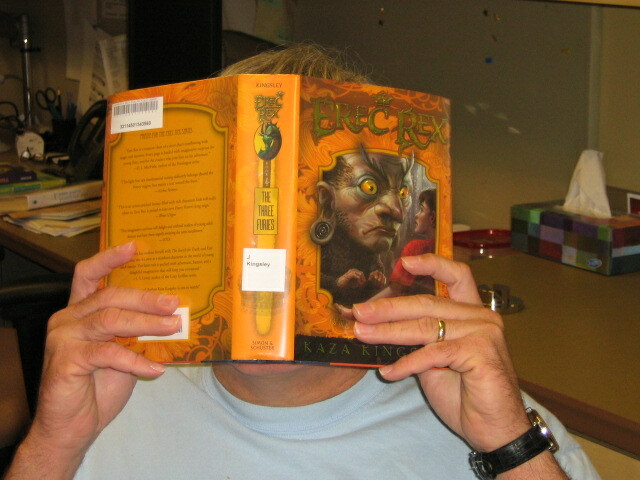 Remember, it's on Tuesday, October 5 from 3:00--6:00 pm at the Myers Park library. October also means the World Series and the end of the baseball season. It'll also mean the end of the Sluggers giveaway that started back in April. Basically, I'll give a prize package to any guy who reads all six books in the Sluggers (aka Barnstormers) series and sends us reviews of them. Sound like a tall order? Well, you'll have until the end of October to do it. That's a little more than 3 weeks. (yes, I know the World series will be over by then!) Anyway, you can click here to find out more and click here and here to see two of your fellow reader guys who won prize packages. I'll also keep the Manliest Books for Boys Giveaway going until of October. Back in June, Charlotte was voted the Manliest City in America. 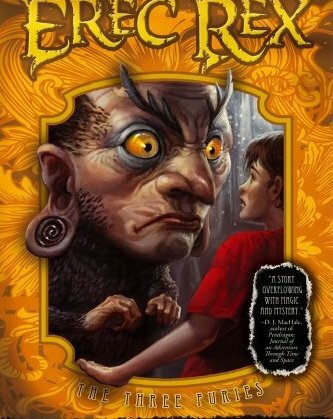 Since all of us who read this blog are MANLY MEN, I created a list of truly MANLY books for boys and I'll give out prizes to any boy who writes a review of one or more of those books. Click here to find out more. All right, MEN, go out and enjoy October and let us hear from you!